This blog gives tips on college money. Get free information on saving money in college, making college more affordable, financial aid tips, and student loans and scholarships. Are you considering medical school? Becoming a doctor can be a rewarding and lucrative career. But it's not for everybody. At least 8 years of school, internships, residencies, and becoming a doctor looks like a far off prospect. It can be done, as people graduate medical school each year. But times are changing, and so are medical schools and admissions. Here are some things to consider before you think about applying to medical school. Medical school is not for the faint of heart. You will be ordered around and probably be put on the spot. Maybe even humiliated. Can you take it? Becoming a doctor is not a fast track to becoming rich. It is long hours, and may be years before you start making the top money. Plus, you have to worry about lower insurance payments and the cost of malpractice insurance. Doctors pay a lot of money to practice medicine. 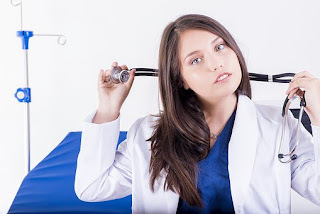 Medical school students have a tendency to graduate with a mountain of student loan debt. Medical schools are focusing on other things today. These include working as team, sharing duties, and even developing bedside manners, commonly call "people skills" today. Medical are looking for those types of individuals, and have opened the doors to some students who might not be complete science majors. They are looking at well-rounded doctors for the future. Are you in? You need to show you can stick with something. Starting college, then stopping, even transferring between undergrad schools can show your lack of commitment. Don't let this show on your medical school application. Thinking about going to a foreign medical school? Think again. You have a language and lifestyle barrier. You may think it's cheaper, but in the long run it has been shown to be more expensive than a US based medical school. Plus, there will be trouble in getting residencies and jobs in the United States. It has been shown that US doctors who studied out of the country have a rougher time passing exams here. Not only is the cost of attending college high, but just try sending off those applications. The postage and fees can hurt your budget even before you take a class. There are ways of reducing the fees or even getting them waived. Many college fairs will have colleges in attendance give fee waivers. Visit the college in person, ask the admissions officer for a fee reduction or waiver. If you apply online or early, your fee may be automatically reduced. You can probably get a fee waiver just by showing your selected college you are low income. Did you know you can also get these fee waivers for the SAT or ACT test? Ask your high school counselor for more info. Remember, you won't get the fee waiver or discount if you don't ask! How to be a teacher and get a teaching job. Find the average teachers salary.